Happy New Year! It’s been a while, we know, but we are back and so appreciate your sticking with us through our absence! As happens, life happened, and the hiatus gave us a chance to get some things in order. Actually, it was because of life that Kristi had to miss a few days with her kindergarten class which got her really thinking about how important independence, routine, and expectations are for children. No one loves the day after a substitute, and that feeling forced Kristi to ask: “What do I ‘own’ in the classroom and what do the children ‘own’?” This lead her to explore this question with her colleagues and we are all the fortunate recipients of all they tried. 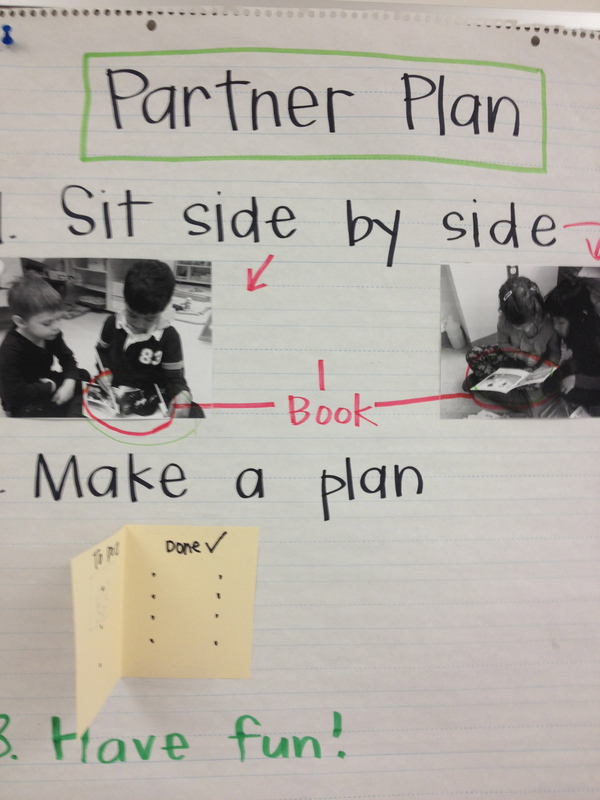 Charts and tools are one way we look to transfer ownership over to children, as well as to provide opportunities for self-reflection and goal setting. The teacher can not be the regulator, corrector, and director at all times. Children learn to become responsible when given responsibility. With this in mind, Kristi and her colleagues dove in using that idea as a guiding principle. Below are some of the things that resulted from this inquiry. To make it even more concrete, the class decided that more than 3 reminders from the teacher to read books would make it an “okay” day. 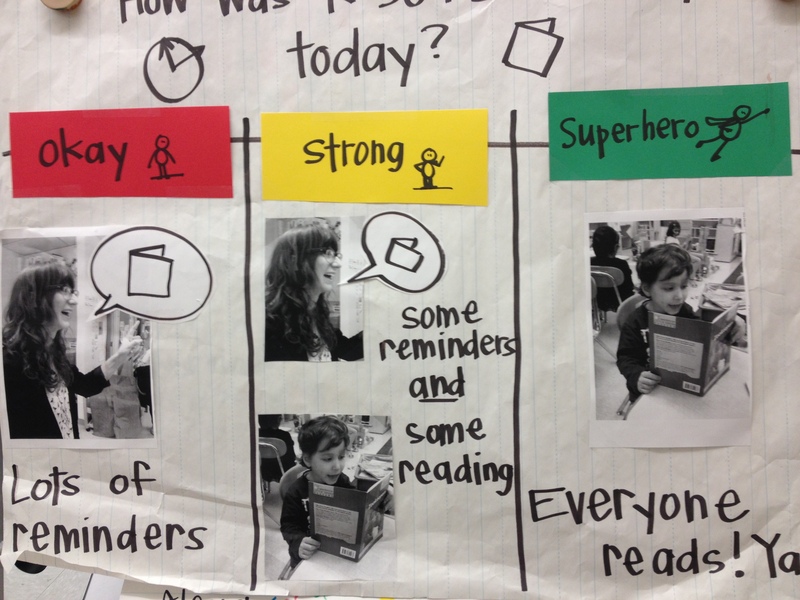 Between 1 and 3 teacher reminders would make it “strong” and no reminders would make it a “superhero” kind of day. 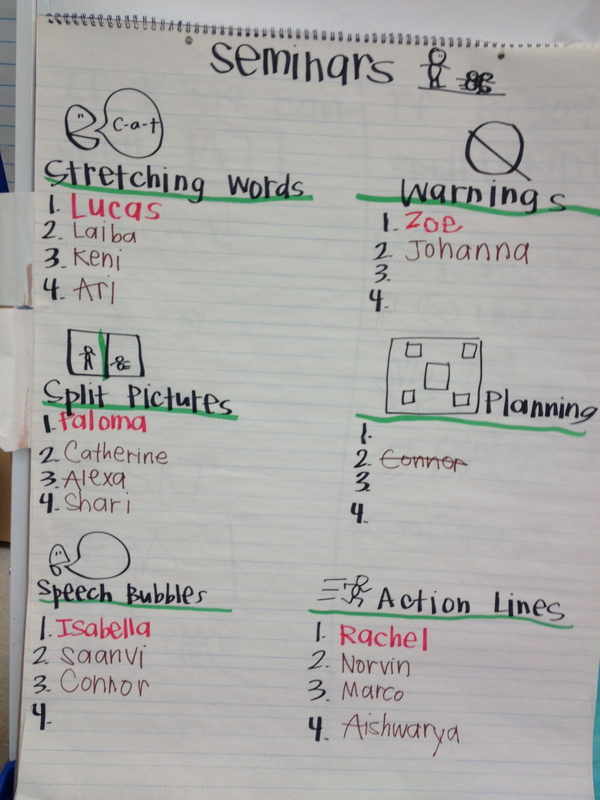 Alongside this chart was a chart that listed ways to stick with reading even when you felt tired or hungry. After a week or two of group assessment, children were ready to self-assess with more honest, reflective results. This time of year is also the time when many teachers are working on partnerships. 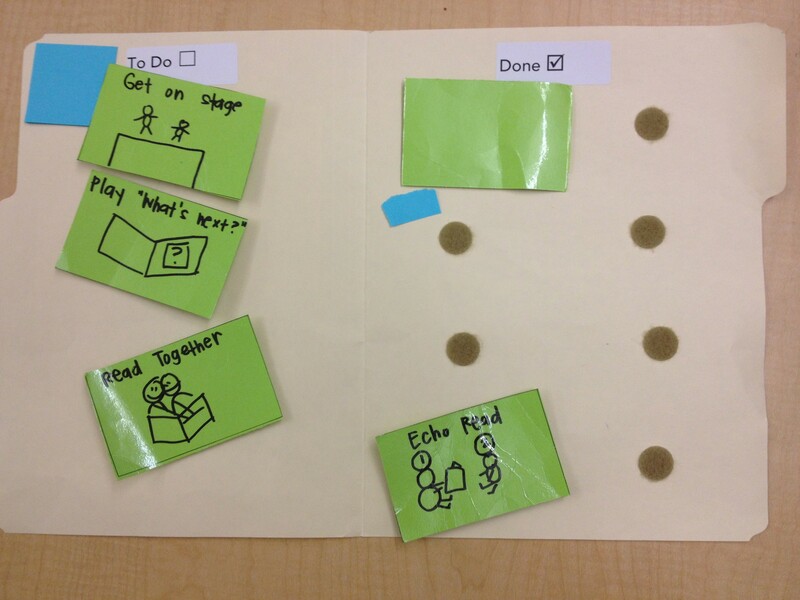 The always wise team of kindergarten teachers that Kristi works alongside at PS 59 in Manhattan developed some playful tools to help partners be productive and stay engaged. Front cover with pictures of the partners. The partners are either apples or bananas to help with turn taking. 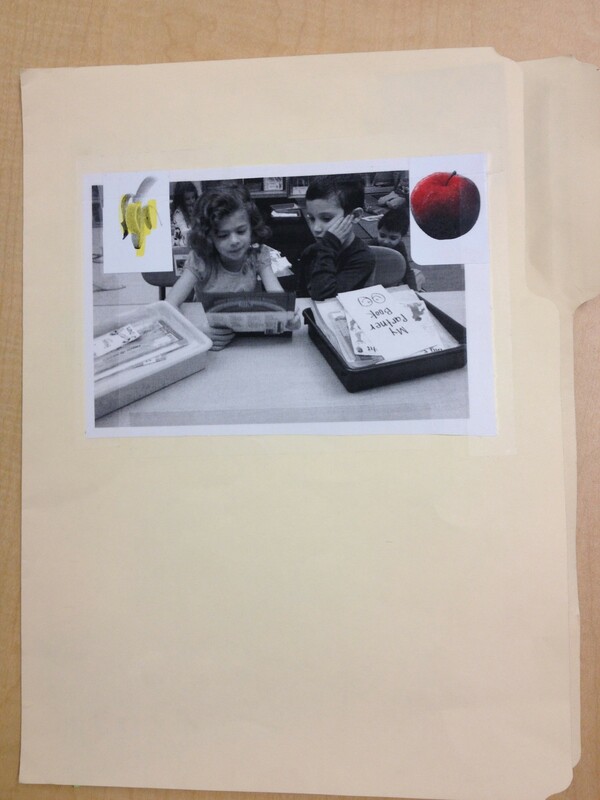 The folder made partnerships feel a bit like a game and the partner activities inside were taught a few at a time, then the process of working with a partner was revisited throughout the unit. Kristi’s mom, who was a teacher for many years, always advised her to “teach yourself out of a job”. It is a beautiful concept, but one that can feel frustrating when you have 24 five year olds clamoring for your care and attention. Kristi used her all about unit in writing (a genre many of her children had been dabbling with since September) to teach towards independence. This happened in several ways. First, Kristi stopped teaching children how to write, and started teaching them how to teach each other. Children who had experimented with something that would be great for the whole class to know were invited to teach alongside Kristi during some minilessons. 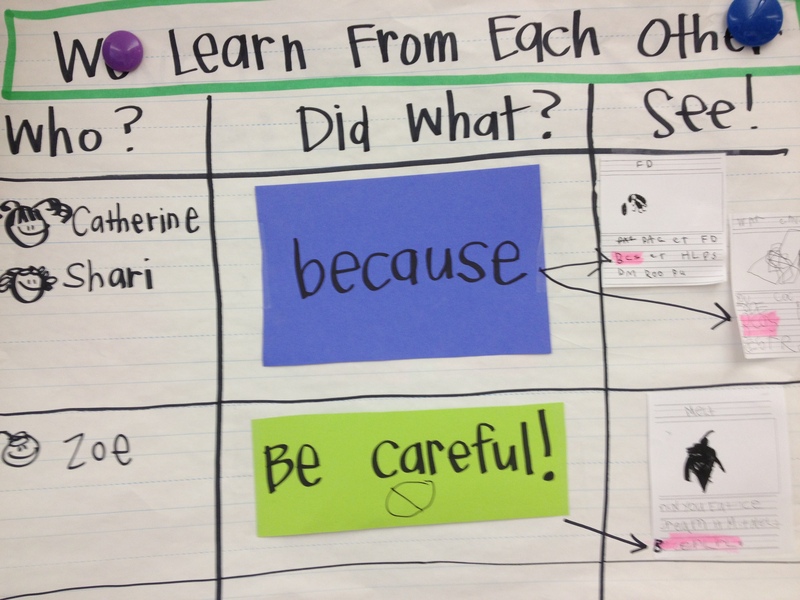 Then the class reflected on who they learned from, what the apprentice teachers did to teach them, and how they did it. 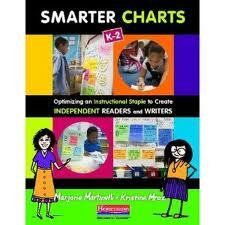 The chart below shows how Kristi made this public with her students. After that, Kristi started getting children ready to lead small groups. She selected a few children who had something they could teach and met with them in a small group. The first step was to identify HOW to teach. The children thought through WHEN writers should do what they did and HOW to do what they did. 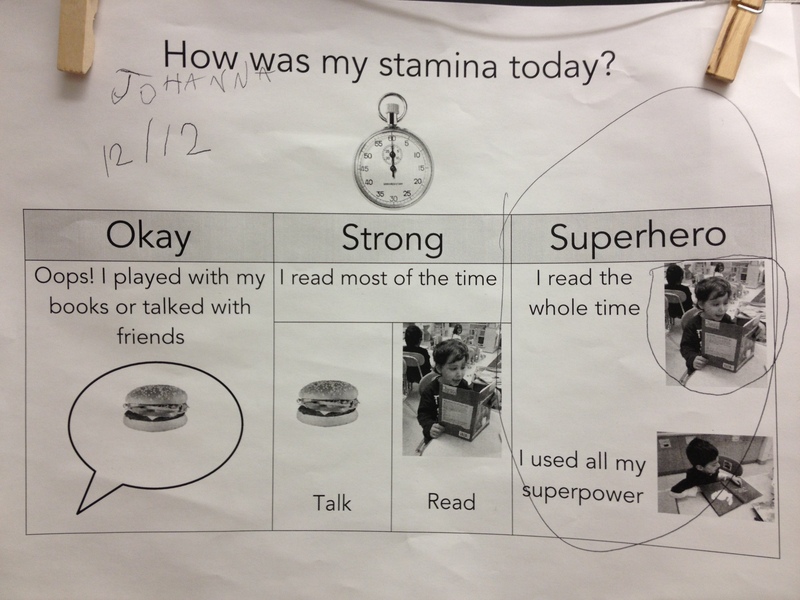 Then the other students signed up for these student led seminars (keep in mind that these are Kindergarten students). The “teachers” showed their own work and taught the others how to do it. Kristi coached in to the seminar teachers with prompts like, “Ask her to try it” and “Say your steps again.” It was incredible to see how the children rose to the occasion of being teachers, and how much more likely children were to use what they were taught when it was presented by a peer. Was it perfect? Absolutely not, but it was a start. Kristi is planning to do student-led seminar workshops every Friday, starting with writing and extending to reading and choice time over the next month. She’ll keep you posted on how it goes! Kristi’s brilliant assistant principal, Alison Porcelli, wrote the book on choice time – literally – with Cheryl Tyler. It’s called Language Acquisition in the Choice Time Workshop and everyone should buy it and read it RIGHT NOW. 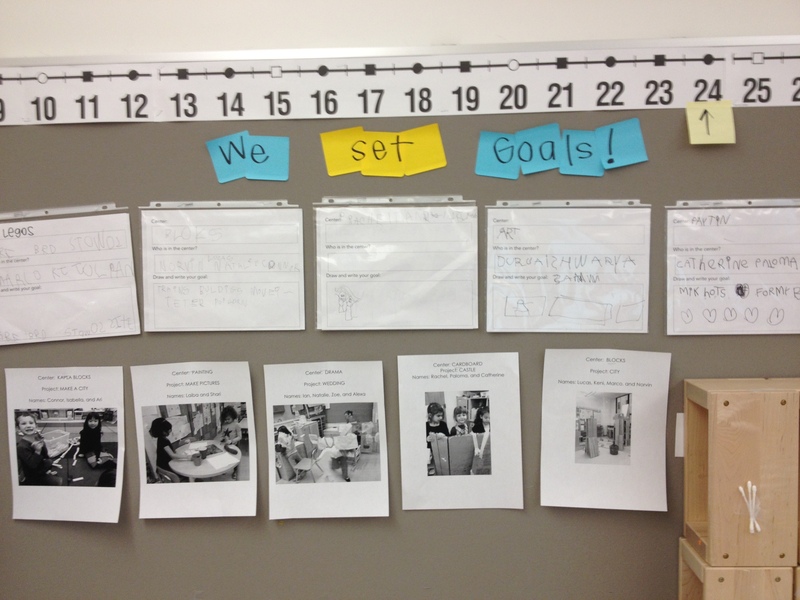 One BIG idea in the book is that children should be setting goals and reflecting on them within choice time. Since Kristi’s kindergarteners are staying in the same centers for 3-5 days, they were ready to take this on. First planning a project was modeled, and then the children took it on. 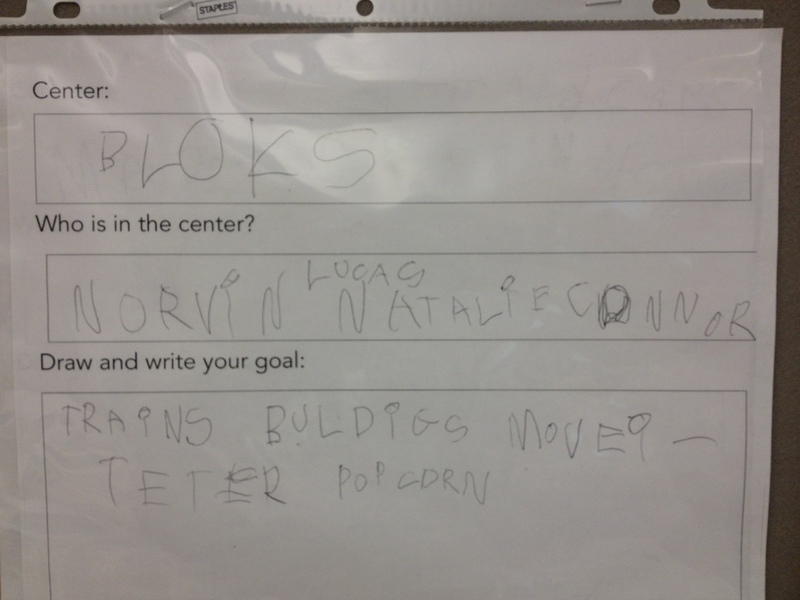 Goals ranged from building on to a city in the block center to throwing a wedding in the drama center. Art center caught wedding fever and decided to spend the week making decorations, cakes, and clothes for the event. This hung in their center while they worked. 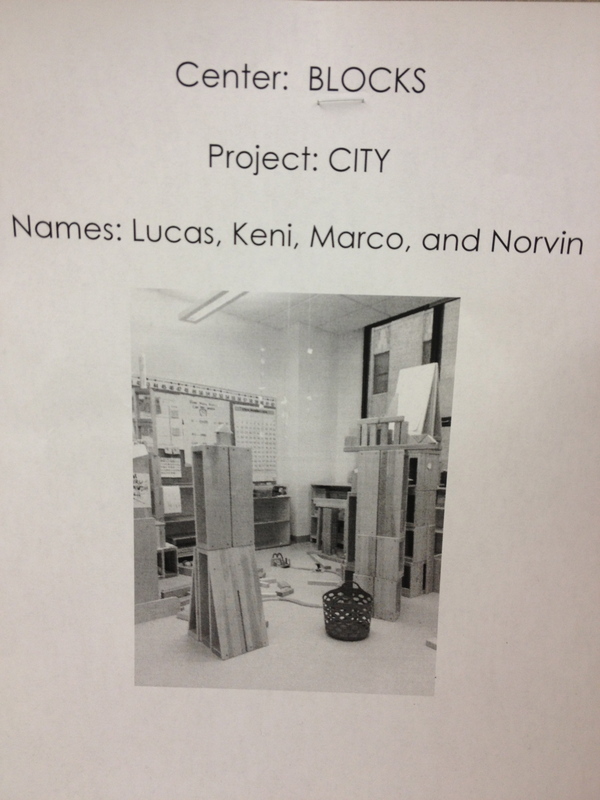 At the end of the week they told Kristi what to take a picture of to show how they had met their project goal. Kristi’s next step is to hand the camera to the children so they can capture the work they did that meets their project goals. This has all been messy and, at times, terrifying – but it has always, always been fun. Kristi’s colleagues at PS 59 have put their brains together to develop ideas, put themselves out there to try it, and laughed when the results were a disaster (most of the disasters were happening in Kristi’s room). Kristi cannot say enough about the brilliant team she works with: Kathryn Cazes, Valerie Geschwind, Mollie Gaffney, Katie Lee and Andrea Mackoff who are incredible teachers and incredible people. Anything you see here that catches your eye was always the result of a team effort, and Kristi wishes to thank them for letting her share them all with the world. Thanks guys! Grab your team close and dive in! Until next time, Happy Charting!